Wall Colmonoy has a long and proud history of its innovative pioneering spirit and dedication to the aircraft industry. It started in 1950 during the post-war ‘jet-age’ when new demands were placed on jet-engine manufacturers. Wall Colmonoy responded with the invention of a new brazing technology in­volving nickel-based filler metals and hydrogen-atmosphere furnaces. In this innovative process, stainless steel components could be brazed to serve under high heat-and-corrosive conditions. This product was named Nicrobraz®. The company’s then Materials Engineer, Bob Peaslee pioneered the application of hydrogen braze for aircraft turbine engine components. The technology and process continues today and is taught at Wall Colmonoy’s Modern Furnace Brazing School. In 1965, Wall Colmonoy Oklahoma City was established to support the overhaul and repair of Jet-engine compressor and hot-section components for Tinker Air Force Base, located nearby. During the Vietnam War, U.S. military tacti­cal and transport aircraft engine components were overhauled at Oklahoma City and then San Antonio facility. Jet-engine com­pressor and hot-section components for the F100, F105 and F4 fighters; B52 and FB111 bombers; C135 and KC135 cargo tanker aircraft; UH-1 Huey helicopter and many other aircraft, were overhauled at these facilities. Wall Colmonoy helped saved the U.S. government millions in dollars in new replacement parts. Borrowing from the successful techniques used to reclaim heat-damaged jet engine parts, in the late 1960s, Oklahoma City facility began overhaul­ing light aircraft exhaust systems and returning them to service with new-part warranties. In 1971, Wall Colmonoy Oklahoma City was approved as an FAA Repair Station License giving them approval to overhaul aircraft components under the FAA’s jurisdiction. 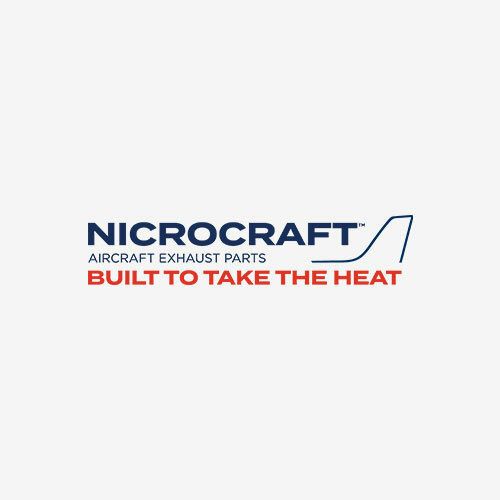 By 1975, OKC began producing new and overhauled aircraft exhaust systems under the brand name, NicrocraftTM, used in Cessna, Piper, and Beechcraft aircrafts and other piston driven engines. The innovative engineering design of NicrocraftTM while carrying an unsurpassed warranty, contributed to the rapid growth of this line. In 2011, Wall Colmonoy Oklahoma City was renamed Wall Colmonoy Aerobraze Oklahoma City. Today, OKC is the center of new and overhaul of light aircraft exhaust systems and proud of its innovative pioneering spirit and dedication to the aircraft industry. Contact us for your aircraft exhaust needs.